“We found out about Gentle Guitar through Google Search and the tipping point for us was that Gentle Guitar offered Skype lessons. We originally enquired about direct lessons with Inga but decided to go with the Skype option. It provided the most practical option that fits with our busy schedule. It has been great. I have been able to learn at the same time as my son because I can teach him directly when we do our homework. He also likes to make sure I have my notes sorted when it is my time to do the homework. We both enjoy the guessing game. The fact that I get to have some personal time with him is a bonus and my wife also gets the opportunity to have some personal time with our daughter while the guitar enthusiasts do their thing. The progression in learning is just right for us. I find that it also helps me in teaching my son when we are left to our own devices. We found the tuition by searching on the Internet and Jesse has been taking lessons ever since for exactly a year now. The method seemed thorough and structured, covering all important basics. We decided to go for Skype tuition because it’s easy to attend the lessons as there is no travel which eases the load with the family. We are encouraged to practice the music together on our different instruments which makes it more motivating for Jesse. Gentle Guitar offers a free trial lesson so you have nothing to lose when trying it out. That is what we did and found it no different than being in the same room with a teacher. — Shelley B. A Skeptical Parent, Fully converted! I read an article about Gentle Guitar and it sounded like a great method to get inspired. The methodology of teaching children seemed different from just strumming chords. We decided to try Skype lesson because of the convenience and the fact that we were struggling to find time for driving to a lesson. We’ve been pleased with the variety of activities and lessons. In spite of my skepticism, we have been fully converted. Skype lessons work amazingly well! Tiama had been doing lessons at school for a year prior to us starting Gentle Guitar. She enjoyed the guitar, but really did not like the lessons, she found them boring. Since starting with Gentle Guitar, she has rediscovered her motivation and her skills have sky rocketed. Very pleased! I always wanted my children exposed to learning music from a young age. 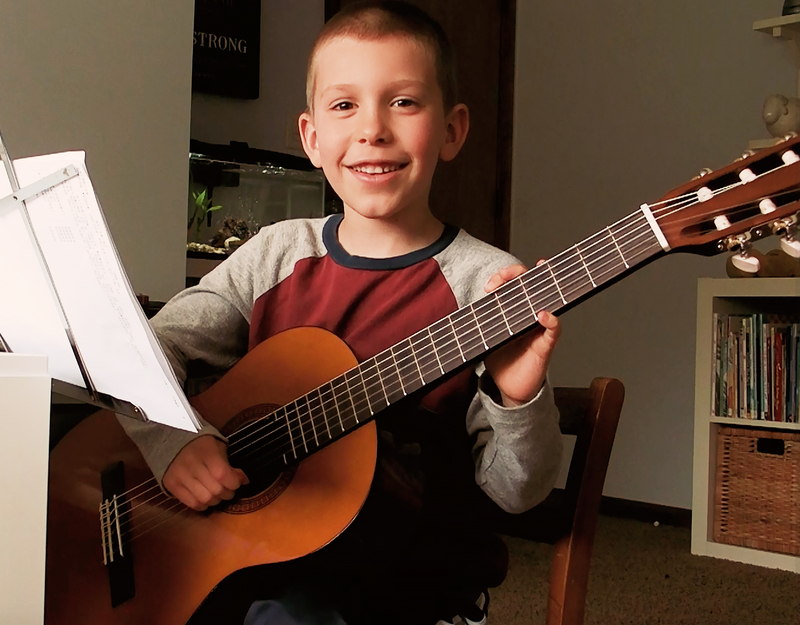 At 5 1/2 Olliver was ready to have proper instruction and Gentle Guitar was a great way to get him started and interested in learning music. We worked through the lessons with our instructor and Olliver was then able to carry on practicing at his own pace. He was so engaged he even started to teach his friends that came over for playdates. I love that Olliver was taught music in a simple, easy, effective manner without me rushing to get to a lesson. Skype works well and it is easy to learn with an excellent teacher. Thank you Gentle Guitar for starting off Olliver with music lessons. He is engaged, excited and loves to learn. We feel Luci has really progressed wonderfully. We are impressed that she can not only play songs, but read and write music. In Luci’s words she likes ‘learning new songs and being good at them’. I think this reflects the really good progression and attention Inga gives to her as a student. She knows how to balance the challenge and fun. Inga is very passionate and professional and has made us feel very confident to have Luci learn with her. She relates really well to children. — Samantha Marra. We liked the emphasis on the ‘fun’ aspect of learning. Madeleine has many other extra curricular activities and we wanted to foster her love of music not make it a chore. In six short weeks Madeleine can look after, hold the instrument correctly and play E F and G. She loves to practice and do her music theory homework. We appreciate that Inga is flexible and can read the mood our five year old and subsequently shape/change the lesson to accommodate her as required. For example if Madeleine is tired Inga changes tact, plays a game and is very patient and encouraging. If you are looking for experience, professionalism as well as guarantee your child will be playing the guitar in a few weeks then these are the lessons for your child. Madeleine wrote her first song and played it today – lesson seven – she is very proud. The morning of her lesson Madeleine is awake extra early, enthusiastic to practice and attend her lesson later in the morning. It’s a pleasure to work with Inga. Inga has a nice nature, is engaging with children, able to allow them to enjoy and learn simultaneously, and provides honest feedback on the children’s progress. 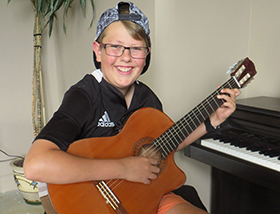 I would recommend Gentle Guitar for private tuition for children especially as the teachers have a gentle manner and strike a great balance between learning and fun. We heard a parent from school mention Inga. We looked her up online and were impressed by everything we read and her style of teaching. I liked that Inga was going to be teaching correct techniques and how to read music. Kyla had been learning in a group at school and didn’t seem to be progressing. Kyla was not being taught correct techniques or anything new from week to week. There was very little time actually working directly with the teacher. Kyla was very impressed that once she progressed with Inga she could start doing some songwriting. Kyla is now learning correct technique and also how to read music. I would really recommend taking lessons with Inga. Kyla loves her lesson every week and has already learnt so much. She has fixed some bad habits that she had picked up from her previous lessons and made good progress with reading music. Inga expects the children to practise several times a week and Kyla now realises how important this is. — Tara M.
We found Gentle Guitar via a google search and have been taking lessons for one term and now just booked for another. We could not get a physical lesson at a convenient time – I was a bit sceptical (about Skype) but decided to give it a go and now love the convenience without compromising on the quality of teaching. 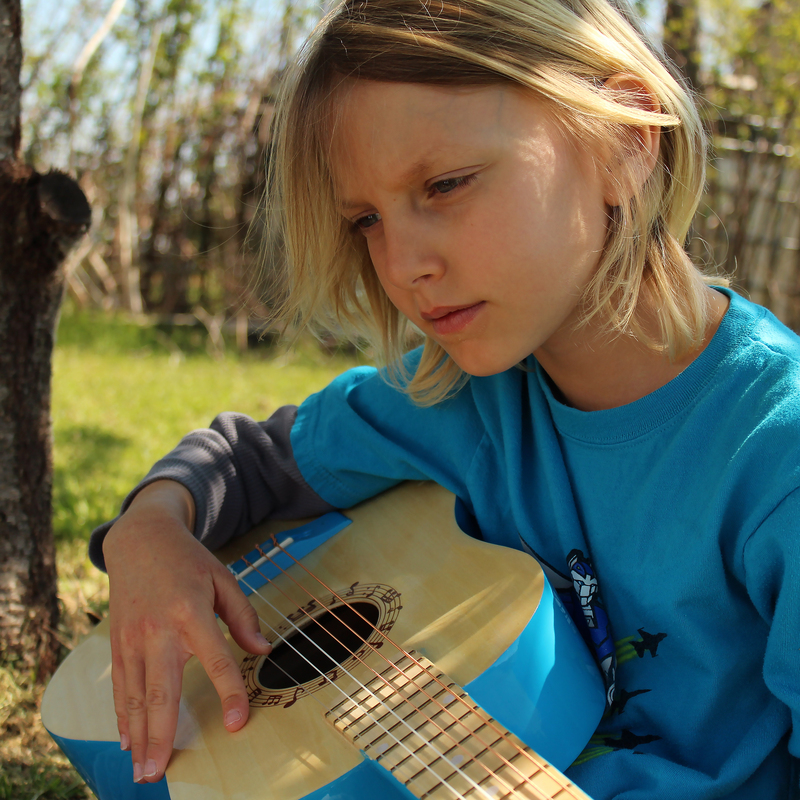 Gentle Guitar is a more ‘traditional’ method that teaches children how to read music as well as how to play. Having all of the resources on tap and the clear, informative content has made lessons productive and practice much easier. Jessica loves playing the songs out of the songbook. Skype is a very convenient method for lessons. The other positive is that the child has to take a bit more responsibility for their learning. They have to listen and watch what is being taught and then reproduce it themselves without any ‘physical’ intervention from the teacher. This has made Jessica learn very well and once she has grasped the technique it is quite solid. Inga is very good at explaining and demonstrating techniques via Skype. We found out about Gentle Guitar just by looking up a guitar coach on the internet and decided to go with Gentle Guitar because from the look of the website and what other students had said. It all seemed really positive. Gentle Guitar also was going to teach me some classical guitar which was what we were looking for. I have been taking lessons with Inga for almost three years. I had guitar lessons with someone else before Inga but I stopped as I wanted to start learning more classical guitar. Gentle Guitar has improved my technique, my ear for music and my overall playing skills. We found about Inga and her classes through a friend who was highly impressed, and Jade has been now taking lessons for approximately 2 years. We like Inga’s personality and her ability to relate to our daughter. We loved that Inga had so much to offer our daughter not just learning to play an instrument. Inga teaches our daughter to read music, write music, play an instrument, encourages our daughter to write her own songs and Inga helps her record her own music. Inga lives and breathes music, we loved her passion.